Jade Dolman is an indigenous artist and educator. In this interview she talks about a program exploring indigenous culture at Seton Catholic College in Perth, Western Australia. How did the Seton College project come about? Sophie Jaques, art teacher at Seton College got in touch with me. She was looking for an Aboriginal artist, a Nyoongar artist, to come and do some work with the Year Sevens at the school. She had been spending quite a bit of time coming up with a curriculum based visual arts programme that focused on Aboriginal art and culture. Sophie was working with the Year Sevens. They’ve all had their work books set out for the Aboriginal art subject. They had some symbols they had been researching from different areas. They were decoding some Aboriginal art using some of those symbols. Then they had started to develop their own designs for the Nyoongar season that they were born in. Sophie wanted an indigenous artist to come in and facilitate the painting aspect of it. By the time I came in, they had already done quite a bit of work. They all knew which season they were born in, so I didn’t even have to go over that. I was just refreshing their memory, which was pretty amazing for me. I’ve never encountered a room of students with that level of knowledge before. It was a surprising and emotional for me. The students had already done four designs. Then they had narrowed down their selection to the one they wanted to focus on. They wanted to represent their season by showing something that happens in the season of their birth. The hunting seasons, or the birthing season, or a weather change that happened in that season. They focused on one aspect. Sophie helped assist them to come up with some designs, and also, referring to different indigenous artists and artworks. They were inspired by those. I went in and gave them a little presentation. I talked about Aboriginal arts, where I come from, and what my connection is, how I like to paint. I showed them some artworks that I’ve done. I explained to them how I positioned everything in order to tell a story and went over some of the symbols with them. I spoke about the Nyoongar seasons. Normally when I do this, there’s some kids that have never heard this, and it’s so much information. With these kids, I asked, “What do you guys know about seasons?” They were just listing off all of these things. I thought, “Wow.” I’d ask, “What month is this season?” It was really awesome to see that they had already done so much research. It had stuck in their memory, as well. It wasn’t just information going over their head. It was relevant to them. I gave them a colour mixing demonstration to help them with their palettes, and some advice on how I paint, and what kind of colours I like to use, and which colours go together. I didn’t want to influence their artworks too much. I wanted to see what they could come up with on their own. They were all very creative students. I was looking at some of their designs, just their pencil designs. I was thinking, “How did you even come up with this?” I kept asking Sophie, “What directions did you give them to help them come up with this?” Every single student’s artwork was so different. Their designs were so different, even though they had very similar stories and they had all done the same research leading up to the project. I was surprised at how different and unique they all were. Were you told what outcomes people were looking for in this project? Yes. I’ve gone into Seton two times. Sophie sent me material explaining what was planned. They had split the students into two groups. 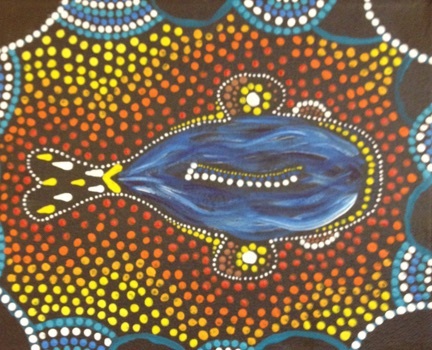 The first group did the Aboriginal art subject and then they switched around. The first time, the first semester early this year I went in to do the first group. That was like the trial session, because that’s the first time they had done a subject like this. That went really well. I was really prepared for what I was going to talk about. I had the slides and having everything ready to go, print offs, and everything for the students. The second time around, it seemed like we all were a bit more confident at how it was going to run. I went in already knowing how this was going to play, which was really good. What sort of planning did you do in advance? How did it feel to see such a different approach? It was good. I always have low expectations, because I like to be surprised. I don’t really go in expecting much, which I think is good, because then I always leave feeling really good. I had a boy in one of my classes say, “That’s really sexist how only boys can play the didgeridoo and girls can’t.” I thought, “It’s not sexist.” I didn’t really know what to say to that. Then one little girl, who was the same age, just said, “It’s this culture.” That really pulled my heart. I feel a similar thing about Seton. Their approach moves me. What do you think the school gets out of this, and what do you think the students get out of it? It is a part of the curriculum now, to teach about Aboriginal culture. A lot of schools I go to have Aboriginal culture as a one off session. That’s a great start but I think it definitely needs to be more than that. One thing about this school was the fact that it’s incorporated throughout the whole year. It’s really part of what they’re studying everyday, rather than just a once off session. I think this is really good, because it helps students develop an understanding over time. I believe it is giving the school a good reputation, as well, for including such a innovative and meaningful program. It’s also good to show that all cultures are a living thing. They’re not static, they’re not the same. I guess it’s good to show how Aboriginal cultures have evolved and exist alongside western culture. I’ve done a few talks up at schools. Often kids have this idea that all Aboriginal painters live in huts and caves. This approach to teaching art helps students appreciate how the culture has evolved. I think that’s just a good way to educate children from a young age. I’ve heard so many children say, “You don’t look like an Aboriginal person to me.” “Do you sleep in a bed? Do you have a lot of furniture?” All these kind of comments. Now, I always say, “I’m an Aboriginal person. I’m at university. I work, so does my family.” It’s a hard thing, a mindset, to change. I just think the ongoing education in schools is really important. That’s what students, get out of it. They get an understanding that it’s a living culture with so much diversity. They get to meet a contemporary indigenous person. They get to understand so much more than just traditional Aboriginal culture. What sort of challenges did you overcome in this? There wasn’t many challenges, but the only thing I can think of was Sophie was away for the second time. I was a little bit nervous on how that would go, because I don’t have a teacher’s qualification. I’m actually going almost at the same level as the students. I was a little bit nervous about how that would go. I feel like I’m not very authoritative in the classroom. It was a good opportunity for me to be able to go in and give all the directions. As I said before, Sophie sent through a letter with the class plan and where the things were kept. The aprons, where the brushes are. All the paints need to be covered after. Little things like that really helped me, as well, to be able to give the direction. Her preparation definitely paid off for me, as well, as an artist coming into the school. Any other surprises that came up for you? Some of the skills that the students had really surprised me. I even took a photo of one of the girls workbook. I opened it, I asked, “Did you draw this?” She incorporated her art skills and her strengths into the art work she produced, the original style art work she produced. I thought was really cool, that they all knew what their strengths were artistically. That’s not something you usually see in a classroom setting. Where is the line about what is appropriate and what is inappropriate? I just always say that everything they’re doing is inspired by Aboriginal art. They’re not making Aboriginal art. They are using it to inspire their own original work. They might be borrowing some techniques, just for this one project. To help them tell a story, in a traditional way. Just making sure that it’s not really taken any further from that classroom. As long as you’re with an Aboriginal person, or an Aboriginal artist, that’s helping you, guiding you how to do it, using original techniques, it’s okay. If it’s without an Aboriginal person, I don’t think that that’s okay. It’s very important to make sure it’s culturally appropriate at all times. Everything I do, I always make sure it’s okay. I get approval from my aunties, and my grandparents. On that topic, you had a look at the Bush Medicine Lesson plans. How do you feel about those? I think it’s awesome, because it has all of the approvals, from the cultural side of things. I think that’s one of the most important things. I also think it’s really good because I get a lot of schools contacting me. They can’t afford to get an artist in, because they’ve already used their budget, or whatever the situation is. They don’t know how to facilitate lessons around indigenous culture. They’re really cautious about doing it in the right way, and getting approval. Even yesterday, I took a call from a lady who’s about to start a project with her class, and she was just really nervous about making sure it’s all okay. She just called me and just asked me 101 questions. She asked, “Can we do a rainbow serpent?,” and, “Can we do this, and this?” I just said, “If you’re not really doing it with an Aboriginal artist, don’t go near representing dream time stories. That’s something that’s sacred. 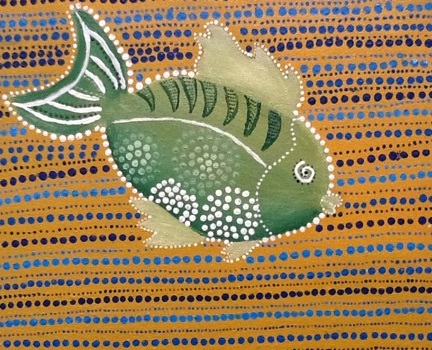 You can borrow techniques from Aboriginal art, as long as you’re acknowledging where those techniques came from and who you’re borrowing them from, as well. Just not taking it further than that. Why does this project stand out for you? This stands out for me because it’s an ongoing project that’s really incorporated into the school structure, and the curriculum. That it’s not just a one off project, or one off sessions. The first time I spoke to Sophie, I could just tell the passion that she had with something like this. You really need someone to be that passionate from the school side of things, to help actually make it happen. She came up with this, because this is something she really wanted. That’s exactly what every school needs, someone like that. There are a lot of teachers out there that have the same passion. Every school has someone to push these initiatives through. What did you get out of this as an artist, and an indigenous educator? I loved having the opportunity to take a class by myself which was really good. It gave me more experience as a teacher, not just a guest coming in and speaking after the teacher has introduced me. It’s taking it from the very beginning all the way to the end. That was a very good experience. I also learned from the kids, as well. They had different ways of painting things. It also opened my eyes, I found myself thinking, “I never thought of that.” Even the style of how they painted it, was really creative. You always see a different side in kids. You don’t have to give them much guidance for them to come up with something creative. This is always really surprising to me. I really like that. I did learn a bit from them as well. If there are other indigenous artists here, in Australia, and they’re thinking about going into schools, and getting involved, what advice have you got for them? I’d say be prepared to be thrown in the deep end, and to be out of your comfort zone. If that does happen, make the most of it. Try to learn as much as you can from it. It is definitely worthwhile. I think this is something that Seton might continue doing annually. I find that so exciting. Maybe the Seton model can be shared and built on. I’d love to see programs like this in schools everywhere.